Today we speak to a man who shares my passion for animal conservation and uses his gifts to do what he can for the cause he loves. 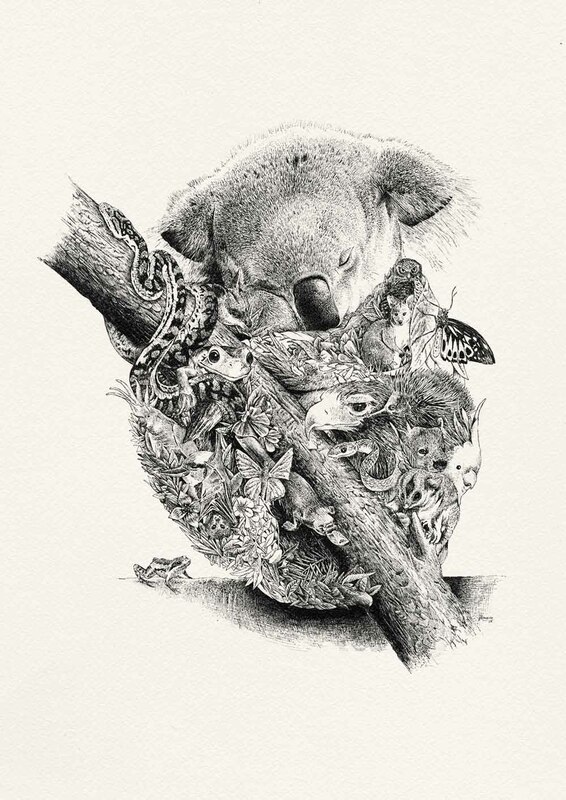 Originally an illustrator Nathan broke away and created his own business illustrating amazingly detailed animal portraits to support animal conservation. Hello Nathan, Thank you for taking the time to answer some questions for us. Your unique and highly detailed work is so fascinating to view and your focus on wildlife and conservation connects deeply with me. Your business Marini Ferlazzo is really inspirational, using your talent for a cause. How did you come about the concept for your business, and in what ways has it contributed to wildlife conservation? I had always wanted to start my own business in art and design. It was 2011 when I began developing ideas after visiting a Eugene von Guerard exhibition in Melbourne. I was inspired by his immensely detailed painted landscapes and ink illustrations. I had always loved drawing with detail since I was a child, so I think that was inevitably going to be a key element of my illustrations. So I began experimenting with ink, drawing animals made of flora. I did more and more of these illustrations and felt this could be something more. If this was going to become a business it needed to have a positive impact that people could be a part of. I love surrounding myself amongst nature and I find animals fascinating, so of course the decision was easy, I wanted to support wildlife conservation. My mother and I teamed up to further develop ideas as to how we could convert these illustrations into products. In 2014, we launched the business and started off with limited edition prints and shortly after introduced greeting cards. We partnered with non-for-profits organisations and found that we could offer them a unique way to spread their messages and also raise funds for their initiatives. Anyone trying to push a conservation message or welfare issue has to compete with the noise of social media, it can be difficult to cut through and get your message to new people. This is where we found we could communicate in a different way and potentially reach new supporters for these important conservation issues. Your style is very distinct and highly detailed. How did you develop your style? I had never used a traditional nib and Indian ink when I began these illustrations, I grew up drawing with graphite pencils, but I loved that it was something new, at least to me, and was hooked. It was a matter of trial and error, the earlier illustrations look very different to more recent ones. The more I drew, the more I understood what made an illustration work and what would compromise the form. That’s the trickiest thing, ensuring the form of the animal is still captured while completing removing all it’s fur, feathers or skin and replacing it with botanicals. How long does it take you to finish a piece? Do you research heavily into the Fauna and Flora forms that you use in your compositions? The more detailed pieces take up to 60 hours to complete, which I do over several weeks. The fauna is always very carefully considered and researched, as they need to be relevant and also engage people so they’ll sit up and take notice. It depends on the collection, as to whether or not I research the flora. Sometimes I’ll include random flora, as it’s not always the focus of the collection. But for instance, the Australian range, it was important that people saw a complete picture of Australia within each illustration. Was it a conscious choice of yours to work only in black and white. How has this impacted your art and career? Yes it was. I experimented with colour in the beginning and really didn’t feel it added anything, in fact, it actually took away from the animal. I didn’t want people to be persuaded by the colour palette, I preferred they chose based on the animal they felt they most connected to. You do collaborations and commissions with your art. How does this effect your illustration practice? I try to fit in one or two commissions each year so clients can get exactly what they would like. However, it’s getting more difficult to find a place for them, as it’s important that each piece can relate to a conservation message, and client’s projects don’t always have a relevance to our business. If we can’t make it part of our range it’s unlikely I’ll take on the commission. Is illustration your sole career or do you balance your creative work with other pursuits? It’s my sole career at the moment, I love expressing myself creatively and working with my family. However, my type of illustration is a very slow process that can often feel quite static, so I have hobbies like martial arts, rock climbing and skateboarding – these activities allow me to release some energy and get my body moving! Can you talk us through your transition from graphic designer to full time illustrator, what were some of the challenges? What are the biggest distinctions, you think, between the two creative careers? Unfortunately, I never had a teacher explain to me the potential avenues of illustration. It was either become a struggling artist with a part-time job at the local super-market or become a graphic designer. I opted for the latter. I was a graphic designer for 8 years when I finally felt like I had achieved everything I had wanted to do – it was no longer fulfilling designing ads and point of sale for beer brands. I didn’t feel like I was doing anything of real meaning, nothing to contribute to the world in a positive way. So I went back to my passion – art. Graphic design is something very different to being an artist, but it’s actually not too dissimilar to being an illustrator. Graphic designers work to briefs supplied by clients. You are constantly in a balancing act of what you feel works aesthetically and what the client wants, trying to reach compromises and finally communicate a clients message. When I began creating my own artworks, I was free of anyone’s expectations or design briefs, I was just expressing myself creatively. The illustration I do now is a mixture of the two, graphic design and art. I create my pieces free of briefs and clients, however, I still consider the viewer because ultimately the illustration needs to work on our range of products. There are animals I’d like to draw, there are poses I’d like to draw, but I don’t do them because they won’t transition well to products. To put it simply, a graphic designer works for clients, an artist works for themselves and an illustrator can be a mix. I think it has the opposite effect on me actually. Working professionally in illustration makes me feel like I have a responsibility to achieve a level of quality. Plus the people I meet who are involved in conservation, are all very passionate and inspirational people – that fuels my passion. It is clear that wildlife and nature inspire your work, is their any other things or people that inspire you in your creative practice? Many other things inspire me; my family, my grandparents, design, architecture, people in conservation like John and Angela Lemon of Painted Dog Conservation Inc. are incredibly inspirational. Anyone who pushes them selves to do the seemingly impossible always inspires me. The Dingo. It reminds me of our family dog I grew up with, Oscar. He was a jet black Kelpie. When I look at the dingo illustration I think of Oscar, who I miss very much. I attended markets, I walked into stores and showed them my prints and greeting cards and I posted work on social media. I wasn’t scared of rejection or criticism, I knew not everyone would like my work, and I was fine with that, but I knew there was a group of people that would appreciate it. Sitting down with David Attenborough and discussing a collection that he would like to see me draw to represent his life in wildlife.